I suppose we all have strange, quirky things that interest us. Things that get us excited while other people just scratch their heads in wonder. For me, one of these is collecting bobble heads. As a child I come home from a Cincinnati Reds game with a bobble head sometime in the late 1960’s. The head was made of something like paper mache and though I did my best to take care of it, the years took a toll and the remnants went into the trash decades ago. But in recent years, bobble heads have become quite popular. No longer are there just team bobble heads but now there are bobble heads that kind of, sort of, actually look like the players. 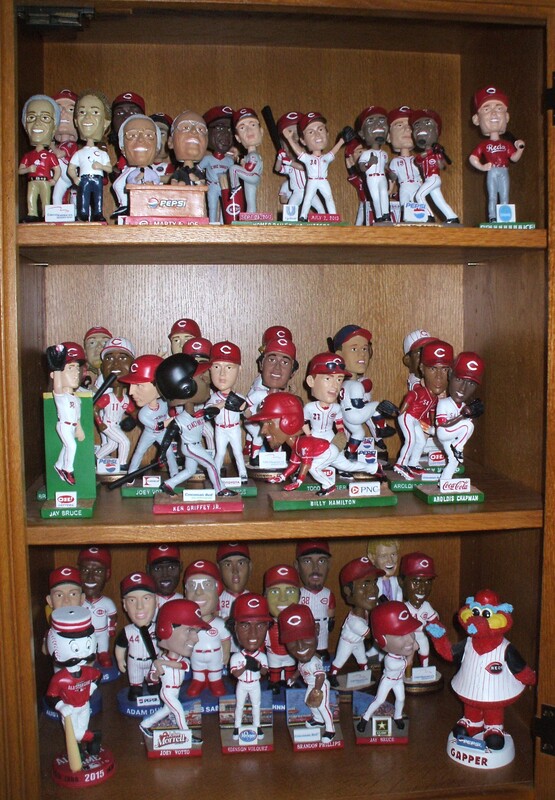 The Cincinnati Reds began giving away bobble heads In 2001. That year I took my boys and my Dad to one of the games never thinking that the Danny Graves bobble head would be much of a draw, I was wrong. The 10,000 bobble heads were long gone by the time we arrived at the game. The highlight of the game was the first appearance in several years of Jose Rijo, seeing him trot from the bullpen to the mound really was a very memorable moment. So, I left the game without a bobble head, but with a great memory. I think the first game I attended and left with a bobble head was in 2002. It was Johnny Bench bobble head night for the first 10,000 fans. I worked downtown at the time and I remember looking out the window and seeing people starting to line up shortly after 4:00 for the 7:10 game. I took off work a little early, got in line and left with my bobble head. Little did I know what I had started. The next year, 2003 was perhaps the most memorable approach the Reds took to a bobble head giveaway. This time it was Gapper, the, well no one is quite sure what Gapper is, but he is a mascot of the Reds. Someone in the front office had the bright idea that they would only give these to first 10,000 kids 12 and under. These were just as fragile and breakable as any bobble head and I have often wondered how many of the 10,000 made it out of the stadium still intact. I was at this game and fortunately, two of my sons were under 12 and so I managed to finagle one of these. Gapper is now apparently one of the more expensive and difficult to find bobble heads. Over the last decade, I started making plans to attend games when there was a bobble head giveaway and scouring ebay to obtain the ones I have missed. There have been a few times that I have not been able to attend the game, but have been able to send someone, usually my sons, in my place to watch the game and bring me a bobble head. I believe that the collection now stands at 51 and is ready for a rest until the next baseball season. This may just sound silly to you, but it is one of my little quirks. There are not that many and they do not take up that much space and serve to keep the baseball season alive all year round. Now, may baseball card collection is another story for another day. This entry was posted in baseball, Humor and tagged baseball, bobbleheads, Humor on September 16, 2014 by Leonard.